Here’s another slightly edited dispatch from my ongoing off-social-media conversation with some political reporters on the obvious implicit bias I see in coverage of Clinton vs. Trump. The reporters I’ve engaged publicly and privately don’t see it that way — and they are, I firmly believe, sincere and honest in that belief. So the task, as I see it, is to build the argument story by story and (as possible) in analysis of the sum of coverage, that they’re wrong, and to do so in a way that honest and expert reporters can read, analyze, and, I hope, become persuaded by. What caught my eye today was this article in the Washington Post, “Inside Bill Clinton’s nearly $18 million job as ‘Honorary Chancellor’ of a for-profit university,” by Rosalind S. Hellerman and Michelle Ye Hee Lee. That story has received professional praise as a well reported deep dive — and it is! Really. By that I mean: it is definitely a long (2604 words) and detailed dissection of Bill Clinton’s involvement with Laureate University, a major international for profit higher-ed company. The reporters play fair by the rules of the craft: they show their work, and a reader can see where each individual fact comes from. But does that make it a good story, an honest one, or one that within the larger story — that of the 2016 presidential election — meets basic standards of journalism as it serves readers interests? That’s what I argued below in my note to one of my correspondents. Here, the point is that the elite political press — like any group of people working on the same stuff in substantial isolation from the outside world — has its own professional criteria for excellence. They’ve got a value system and an expectation or understanding of what represents good work or bad. They’re not all wrong in that. But as far as I can see from the outside, theirs is a bunker-dwelling, mostly technical standard: well reported = good, for example. I don’t think that there is a conspiracy at the Times or the Post, or CNN or what have you simply to shiv the Clintons. But what I think outside the bunker (and please do recall: a presidential campaign is a mind-and-body deranging experience; these folks really are working without access to a lot of the reality checks that could help) those of us who are looking at the coverage both closely and synoptically see the problem not as one of reporting, but of coverage. That is, what matters is the way stories are assigned, framed, their narratives interpreted within each piece, how they’re edited and placed (2604 words!) affects the overall message readers and the electorate as a whole receive. What there was, instead, was a reason to ask whether or not such special favors might have taken place. The answer was no. There the story should have ended. But because this was the Clintons, and this is the elite political press, it was impossible to accept that answer. Hence what is a type specimen for how the press is getting this election wrong — with potentially disastrous consequences. I agree with you on the sum, though from where I sit, with my full time job in higher education (and a professor’s kid, and w. two professor-siblings and, and, and…) what bothers me most about that clearly outsize wage is that it is less of an outlier than it should be. As I’m sure you know, top academic positions at a lot of places are now paid at seven figure levels. A million or so/year as a college president is different from $3.6 million/year as an honorary chairman, certainly. But it’s also true (and a scandal) that higher ed, both non and for profit has headed down the same path for CEO and senior management compensation that large businesses have. That’s troubling. But what got me about the story was the contrast between the reporting craft you rightly recognize: meticulous, detailed pursuit of both individual incidents and the financial details…and the lack of any substance to the clear thrust of the story: that this was another example of soft corruption in the Clinton family. You look at the lede and it clearly asserts a pay-off. Clinton invites someone to a working dinner who is an FOB, who later hires Bill for lots of money. * the Laureate arrangement reveals how the Clintons mixed charitable work with the rest of their lives. Which seems to add up to that people who donated to political campaigns donated to the foundation and sometimes did business with them, which sounds rather like just about every modern American politician. *Clinton as honorary chairman added reputational value to Laureate. This is, of course, obvious, but it was a nice quote. *Clinton gave unpaid speeches at its campuses, and hence became (i.e. saw something that met his own goals) interested in the company. *Laureate is a big business that is involved in things big businesses do, including going public and experiencing a private buy out. *Laureate is in a business that has had some contention with regulators and may or may not be one of the major bad-actors in that problematical sector. We don’t know until much further down in the piece what Laureate’s actual reputation is in this sector. *a brief note to remind us that this story is in part an extension of the Judicial Watch campaign against the Clintons. I’d love as a general rule to see more noting that the sourcing for many of these stories comes from a big axe being ground, but that’s just me. *Again we learn that the point of hiring Clinton was to burnish Laureate’s reputation by aligning it with what it (and most people see) as the good work of the foundation. We also learn that it wasn’t that effective — the one deal discussed went against Laureate. *Then we learn what Clinton did: he spoke to students; he was used in company literature; and, most tellingly, Laureate paid to send students to a Clinton Foundation conference, an experience that students apparently found incredibly valuable. *Trump lied about alleged corruption at State and Laureate. *In discussing that lie, we learn that the amount of money State provided Laureate was risible, and devoted to student scholarships. *One sentence on Trump University facing multiple fraud investigations (and no mention of the AG scandal). *The last suggestion of a problem with the Clinton-Laureate connection: a guy the Clintons have known for 46 years was invited to a policy dinner. TL: DR — Clinton got paid a ton of money, and for it, two Laureate executives got invited to working dinners; Laureate got a de-minimis amount of money for scholarships. As far as I can tell, that’s it. The stuff about Clinton being used on literature and all that — you and I may not like it, but again, there’s no suggestion that it was either improper as a contemporary business practice or terribly effective. Most important: it had nothing at all to do with Hillary Clinton and her State Department. Not one bit. It’s just a “look, Bill Clinton’s making too much money” story. And this is what I find both telling (badly) in current campaign coverage, and revealing of the genuine and honest differences between reporters and their audiences in what each thinks of as excellent journalism. I’ll say again: this is a J-school teachable example of meticulous reporting. With the one exception noted above — inadequately IDing Judicial Watch and their strongly partisan and long-standing campaign against the Clintons — this is exactly as one would wish, a detailed story in which the reporters make clear their evidence, enough so that the careful reader can in this case feel confident of the claims being presented as facts. I can see why reporters would recognize and value that professional accomplishment. IOW To me, this story really was a one liner: “There is no evidence….” Everything before and after that is a mass of suggestion and ultimately innocuous incidents presented as indicators of impropriety. Yes indeed: 17.6 million smackeroons is a ton of money. It’s wrong on its face that anyone should receive that kind of payout for more or less any work one can reasonable do over five years. But Bill Clinton is hardly the only, or the biggest example of income inequality and insane pay rates at the top of the corporate pyramid. As a piece that casts a sidelight on the current campaign — it’s just not there. All this, of course, in the context of the Trump University scandal that has just advanced a lot as we get more information about Biondi and Abbot contributions that look awfully like bribes — which worked! So at the tail end of a too-long note: this is what I’m arguing: The failure of the elite political press corps hasn’t been that individual stories are bad or even unreasonable to pursue, from some angle (in this case, not the one the reporters took as suggested above). It is rather, in constructing the frame in which a story like this one appears before its audience confirming the impression produced by decades of reporting on Clinton scandals that weren’t as described. This works because it fits the things we already know (even if they aren’t true): the Clintons are greedheads who will do anything for enough money. Meanwhile, again, Donald Trump has a foundation that is implicated now in a bribery scandal, and he owned his own “university” that did genuine harm to its students. Yes, David Farenhthold did important work in breaking that story. I hope there’s much more to come from him and others. But after a summer in which the AP, The New York Times, and many others have hammered what appears to be a nothing-burger of a Foundation pay-to-play story, that Trump counterpoint is, it seems to me, drastically under covered. And that‘s the context in which this Clinton story becomes part of the problem, not part of the solution. So that’s my take. Over to y’all. 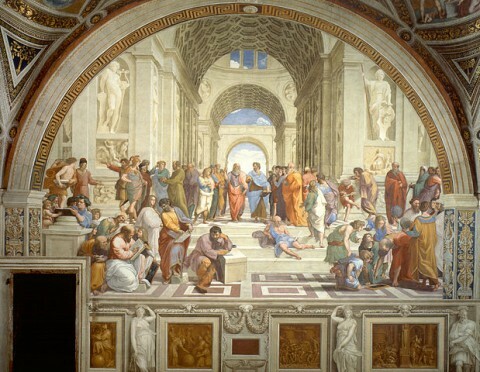 Images: Raphael, School of Athens, 1511. 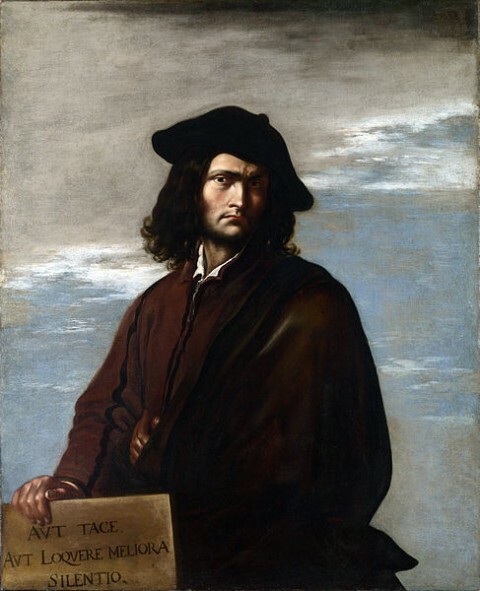 Salvator Rosa, Self Portrait, (holding up the motto, AUT TACE / AUT LOQVERE MELIORA / SILENTIO, trans: “Be quiet, unless your speech be better than silence.” c. 1645. 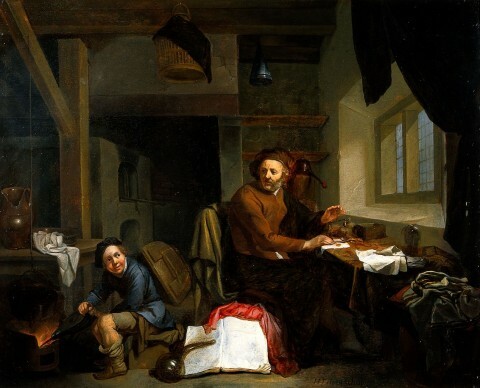 Hendrick Heerschop, An alchemist making gold, 1665. This entry was posted on September 6, 2016 at 9:59 am and is filed under Election 2016, journalism, Journalism and its discontents, McCain, Politics, words mattter. You can subscribe via RSS 2.0 feed to this post's comments. I could probably get a Pulitzer writing this kind of stuff. Luckily, I already have a fulfilling career.